It’s hard to believe that such a small fire can cause so much damage. 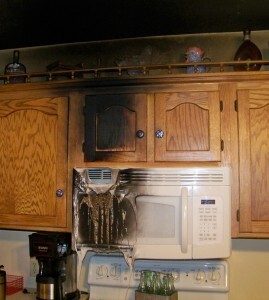 A week after Easter, an accidental fire in our kitchen destroyed our microwave oven above the stove as well as one small section of our kitchen cabinets. Smoke and soot was everywhere. We didn’t need the fire department because the fire went out pretty much on its own for which we are grateful. What we needed was someone to help us clean up the mess and figure out what to do next. I called my insurance agent who encouraged me to call a contractor who could help us restore our kitchen to its pre-fire condition. Our insurance would cover it, he said, less the deductible of course. That was almost a month ago. I’m not going to mention any names or say anything negative here about restoration companies … but so far this has been one of the most discouraging and frustrating experiences of my life. It appears that Marci and I will be staying in this hotel for another … month … maybe longer? We don’t know. Our lives have been turned upside down, all our earthly possessions (furniture, clothes, other personal property) are in a storage warehouse somewhere (presumably being cleaned), our kitchen has been torn apart and must be remodeled, the walls throughout the house are dirty and must be repainted, and we have no assurance at this point that the astronomical costs of all this will be covered by our insurance. Obviously, this is a story that is unfolding and we’re expecting a happy outcome. While we are feeling very inconvenienced and faced with decisions and difficulties we never imagined, we are trying to remember that we are all OK, our house is still standing and with the help of God, we’ll get through this. When I think about all the folks we know who lost their homes in the fires here a few years ago (or have had to endure all kinds of natural disasters), I realize that we don’t have that much to complain about. Yesterday was a good day. Our church (College Avenue Baptist in San Diego) held its first “unified” service, a bold attempt to bring all the generations together in worship and by all accounts it was a wonderful success. God’s presence was obvious in the service and our pastor Carlton Harris preached a very encouraging message on trusting God in trying times. We are hoping and praying for you guys to move back into Casa Rice. For the end of the mayhem crew’s holding you guys hostage!